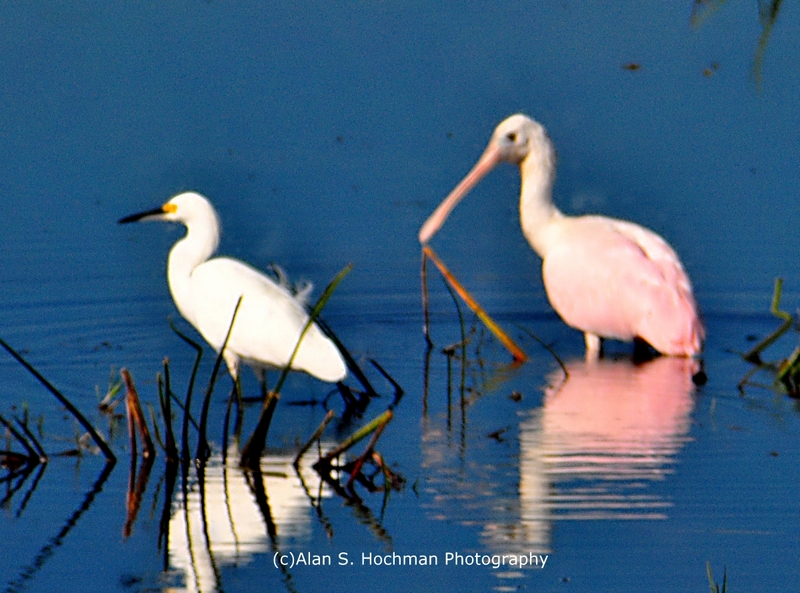 This photograph is of an Egret and Roseate Spoonbill captured at the Holey Land Wildlife Management Area in Florida. The camera gear used was a Nikon D90 camera body attached with a Tamron 28-300mm lens and a Tamron 2x teleconverter. Although both birds are fairly common to the area, this was the first time that I have seen them together. The roseate spoonbill gets its name from its roseate colored plummage and the fact that its beak is shaped like a wooden spoon. Thank you Julianna, I was lucky to capture them so close to each other! Thank you! This is one of my favorites. You know what your doing. Here is the proof! Great photo. Do you only photograph in Florida? Amy, it was a chance occurence! Fantastic how you got 2 different species together in one photo! Love the symmetry in this photo. Do you teach any wildlife photography workshops? Awesome combo – a Roseate Spoonbill with an Egret. Fabulous work Alan. Thank you Kenny, I was lucky on that photo! I remember the first time I saw one of those. It was 2010 and I was in Florida. It was a jaw-dropping experience. Nice shot Alan. Keep up the good work. Alan, this is a very lovely photo. Your work is incredible and how you capture their beauty quite amazing.